Electronically controlled hot-melt glue applicator with a very high melting capacity for cordless gluing. 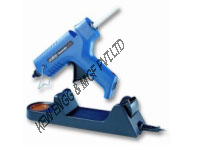 The range-topping glue applicator model combines convenient handling and superb performance. The encapsulated melting chamber stores heat that allows you to work efficiently without any trailing cable. Plugging the cord directly into the unit provides the capability of applying large quantities of hot-melt adhesive in one uninterrupted operation.